Asparagus to me is the surest sign of spring! Those lovely little green tips poking out of the ground mean winter is over just as much as the daffodil or the lily. And it makes sense to think of asparagus in that way since they are in fact part of the lily family. The season of this delicious vegetable lasts for about six weeks. If they were to be left alone and not harvested, the asparagus tips would actually sprout into featherly, dill-like fronds. The word asparagus evolved from the old English, “Sparrowgrass”. Depending on the part of the world and the growing techniques, asparagus can be green, white, or purple. When buying asparagus, make sure they are firm, the stalks straight, and the tips tightly furled. If the tips are wet or slimy, do not buy it. The size of the spears is really about preference. Some prefer thin, some prefer thicker. Be careful of asparagus that is too thick though, they could end up having a “woody” flavor. Speaking of a “woody” flavor, always trim the tough ends right before cooking. 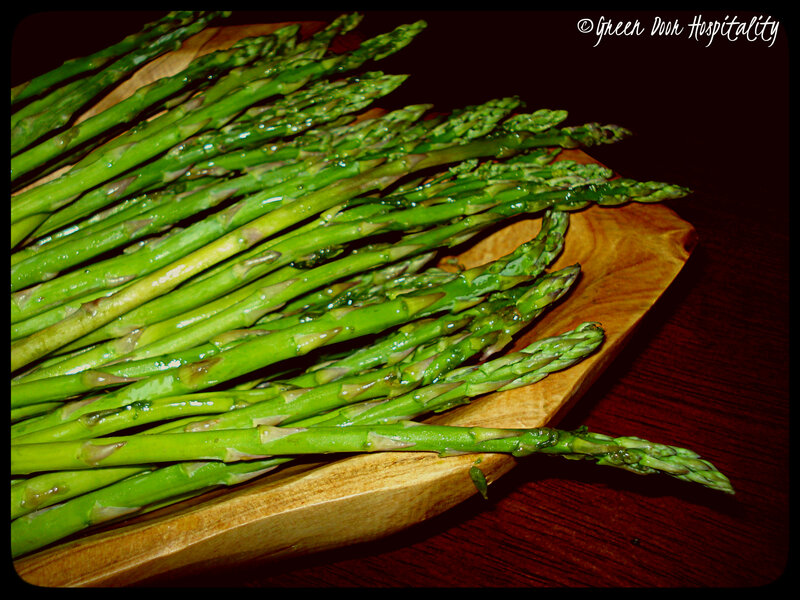 Below are some great dishes from Green Door Hospitality that include Asparagus. Simply click on the image to be taken to recipe! LOVE asparagus, roasted with sea salt is my favorite. All the recipes sound delicious. I am going to try that balsamic brown butter sauce. My favorite vegetable. Each of your recipes are worth a try, but I love the soup and will try that first. Man, I would LOVE to try the asaparagus-lemon soup. What a combo! Asparagus is one of my favorites… I love all these delicious ideas! Love asparagus and I PINNED a couple. Thanks Jessica. So glad it is spring somewhere. We still have two feet of snow on the ground BUT the air definitely had a tang of spring in it today! Hurray. A very versatile vegetables good for so many dishes. 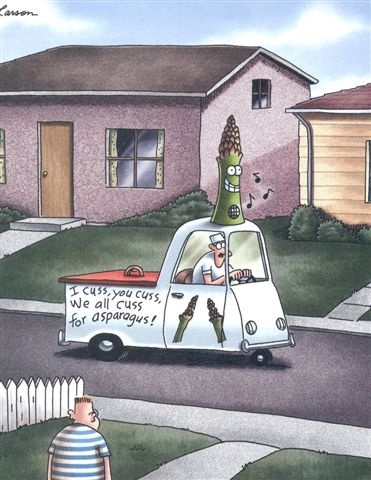 This entry was posted on March 6, 2014 by Jessica Romigh in Ingredient Spotlight and tagged asparagus, asparagus tips, Far Side Cartoon, ingredients, lily family, sparrowgrass, vegetables.